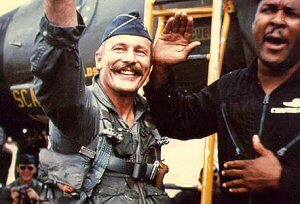 For a related story, see “Legendary Fighter Pilot Robin Olds Dies” and Gen. Olds Official Air Force Biography and a Colorado Springs TV news video of the memorial service. Stan Goldstein’s pictures from the Memorial. See Gary Baker’s wonderful pictorial memorial to General Olds. Also see a memorial video. JB Stone played a significant role at Robin’s Memorial Service. He delivered one of the eulogies at the U.S. Air Force Academy Chapel. He told of the first time he meet Col. Olds, who as the new Wing Commander of the 8th Tactical Fighter Wing called a meeting of all the pilots. At the time JB had about 60 or 70 missions North, had an engine shot out from under him and several bullet holes here and there on some pretty hairy missions. It came out a little louder than JB intended. Robin heard it and immediately fixed JB with those steely eyes, and repeated his statement forcefully again. And JB said: “Robin did exactly as he had said he would. “ He was a warrior who would fearlessly go where others feared to tread. And JB was later picked to help Robin plan and execute Operation Bolo, wherein F-4s masqueraded as bomb laden, F-105s to lure MiGs to come up and attack them. Seven MiGs went down in flames. The Military Channel has run the episode several times titled as “Ambush” in the Dogfight series. Robin’s oldest daughter, Susan lead off the remembrances with stories of being a teenager living at the Academy while Robin was Commandant of Cadets for 3 years. Robin taught her to drive on the Academy grounds and ride horses at the equestrian center. It was okay to date more than one cadet at a time because no one would dare do anything untoward with the Commandant’s daughter. General Ralph Eberhart was a senior Cadet Wing Commander when Robin took over. He told the famous incident of Robin’s first meeting with the Cadet Corps. Robin had been directed to lose the handlebar mustache – his trademark as leader of the “Wolfpack.” On a given signal at the end of Robin’s speech, 4,000 cadets whipped out and donned black-paper handlebar mustaches and began stomping and shouting, Olds, Olds, OLDS!!! Robin rose to his full height, jaws clenched eyes blazing – then extended his long middle finger and flipped them all a big sweeping bird – with a huge grin on his face. Brigadier General Bob “Earthquake” Titus spoke of how Robin transformed the 8th Wing into The “Wolfpack.” Where the “Go get them, men” from the previous leadership was replaced by “FOLLOW ME!” Deadwood were sent home, and tactics changed. Base services were available 24/7 to the men he was sending into combat 24/7. No more shutting off the hot water at midnight, or closing the bar. He told of a pilot, I believe named Conway, who while gleefully celebrating a successful mission proceed to rearrange or destroy some of the O’Club furnishings. He was ordered to report to Col. Olds’ office at 0800 hours. He was there promptly. Robin however was dreading the chewing out he was going to have to administer for something he himself had been guilty of many times. He braced himself, put on his sternest visage and entered his office at 0815 to find Conway standing at attention. Conway saluted smartly and said, “Sir, you’re late.” That cracked Robin up. The damage to the Club got paid somehow and another tale was added to the lore of Robin Olds. Captain Jack McEncroe, USMC, told of his close friendship with Robin living near in Steamboat Springs. 30 years of watching Robin’s God-Awful backswing on the golf course, 30 years of skiing through the trees in fresh powder up to their knees, 30 years of listening to Robin telling the Cross-Eyed Bull story. Verne Lundquist, Hall of Fame Sportscaster tried to demonstrate Robin’s backswing, which featured a couple of contorted pauses on the way up, then a mighty downswing. On one occasion the ball carried to the green, bounced a couple of times and went into the cup. “You just got a hole in one! It went into the cup,” shouted Verne. “Well, that’s the point isn’t it,” said Robin. When Robin was selected for induction into the College football Hall of Fame as an All American on offense and defense at West Point, he asked Verne, “Is this a big deal? Do I have to go?” Verne told him yes. Robin went and made a gracious acceptance speech. On another occasion he and Robin were being harassed by some obnoxious guy who wanted to pick a fight with Robin. Robin stood up, squared his shoulders and said, “I’ve killed more people than you will ever know, for less reason than you are giving me right now! Now sit down and SHUT UP ! When Robin’s health started failing last February, his daughter Chris quit her job and moved to Steamboat to take care of her Dad. She took Robin on long drives through the mountains with a picnic lunch to share at some scenic spot. Robin’s grand-daughter Jennifer told of her grandfather helping her as a young child, to set out a bowl of salad to feed Santa’s reindeer. Sure enough, the next morning the salad was gone and reindeer tracks were in the snow all over the porch. A long time later, she came across some wooden reindeer feet that Robin had carved to make those tracks. Christina said that it was only in his last week or so that Robin started to get really tired. He still would tell those who called that he was just fine, just getting old. She was with him when he drifted off to sleep peacefully and after a few minutes, drew his last breath. Chris orchestrated every detail of the funeral service, the flyby, the graveside service, of course with help from Robin’s friends and splendid cooperation and coordination from the Academy Staff and the hotel where the reception and following Fighter Pilot Wake was held. The flyby consisted of aircraft in trail at 30 second intervals. First a T-33, second another T-33, third a P-51 Mustang, fourth a MiG 17, fifth a flight of four F-16 from the Colorado Air National Guard, and sixth a flight of four F-4’s. The F-4’s, one from Tyndall and three from Holloman, are actually drones to be used in weapons testing. But for this occasion, they were flown by pilots and led by Lt. Col. “ET” Murphy of Tyndall. “ET” is also a member of our “Aspenosium” group of active duty and retired fighter pilots who get together for skiing, partying and presentations by those involved in fighter development, weapons, and tactics. [Robin’s call sign] and initiated a sharp pull-up out of formation so WOLF ONE was heading straight up . . flew vertically into a pin point. It was spectacular and precisely executed, directly over Robin’s gravesite. One final note reinforces the fact that Christina is without a doubt her father’s daughter. It involved the presentation of the flag to Robin’s survivors : Susan, Chris and Jennifer. The 1st flag was presented to the eldest, Susan. The 2nd to Jennifer, the youngest. The 3rd was destined for Chris. But she chose to direct her flag to be presented to Robin’s comrade-in-arms. Col. J.B. Stone. This unselfish and completely unexpected act, deeply touched JB and all of us who understood the bond between these two men. The kind of thing Robin would’ve done.